Last night, we had the opportunity, as a family to visit some friends we hadn't seen for a few months. It was great to see them again. One was "our adopted daughter" from Brasil who is attending BYU and hadn't seen Britten since he was teaching her brother, who is now serving a mission. The other visit was with a recently returned Senior Missionary Couple who were one of the Church doctors in Brazil who took such wonderful care of Karla and I and also of Britten from just moments following the accident. It was such an great experience to see them again. For Britten, it was his first time meeting them, at least in his memory. Britten does remember up until a few days before the accident, but then he skips to the air ambulance transfer to Utah. So, he doesn't remember any of the accident or of the Hospitals in Brasil. That visit reminded us of several things. We realized again how indebted we are to so many wonderful members and leaders of the Church in Brasil, and in the U.S. Also, we are so thankful to the many health care professionals in Brasil and in Utah. Some have speculated that health care is better in the U.S. but in our experience that is absolutely not true. Britten had wonderful people caring for him here and there. I would recommend Albert Einstein Hospital every time. We are reminded as well of all our friends and family throughout the world who fasted and prayed in our behalf. Our visit reminded us again also of the many miracles that we witnessed and continue to see in Britten's life. Some I'm sure are getting tired of us referring to Britten's recovery as miraculous. I'm sorry to them, but that will probably not change. As we reviewed our experience in Brasil with our Friends we were reminded that scientifically and medically speaking it would be impossible for Britten to have survived, and even then if he had survived the expectation for any recovery would be extremely low. Karla and I feel, at times, that some feel that we are exaggerating. The fact of the matter is, with no blood flow to the brain for a period of time maybe even a few hours or days, the prognosis really couldn't be worse. However, one of the foremost Neurosurgeons in the world will also tell you that "we all witnessed miracles and God's hand at work"! We know that Britt's life was preserved for a reason and he is a walking miracle. I hope that when you get to see or meet Britten that you will help us remember that. He is doing so well, we don't want anyone to forget what "The Lord Hath done". I really don't have words that adequately express our love and gratitude to Our Loving Heavenly Father and His Son Jesus Christ for all our blessings. We again thank all of you for your faith and prayers. We are also very grateful to all the generosity and all who are working so hard to make Britten's Run a success. What a wonderful week our family has had, full of fun-filled activities. A family tradition for many years has been watching the Fireworks in Idaho Falls, ID. sponsored by Melaleuca. Britten had a wonderful time, as usual, watching the spectacular show. We want to express our appreciation to our "Melaleuca Family", for the love and support given to our family, especially over the last few months. Another great thing about summertime are the Family Reunions! We all enjoyed being together, but Britten thoroughly enjoyed seeing a lot of family for the 1st time in 2 years. Spending time with cousins his age that recently returned from missions and some that are leaving in the very near future. It was a very sweet reunion for them! Britt was thrilled to play volleyball with his cousins, and still has his wicked serve! We are amazed at Britten's desire and determination to include himself in activities that would be very difficult with limited eye sight. You would never know his vision is only coming from 1/4 of one eye. He just wants to do everything he used to do. And the best part is.... He Does. Britt enjoyed a visit with his Cool "special" Uncle, that he loves so much! the Places we've been.....and the Memories we've made along the way. Britten was so excited, as fifteen 4-wheelers headed for the Top of Baldy. This has been an annual trip for our family, as Britten and his Dad lead the way. 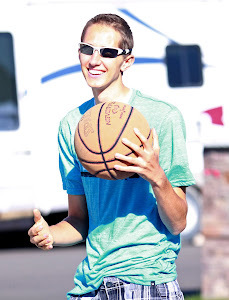 Britten has a group of friends that did so many fun things together in High School, including playing basketball. They called themselves "the Cyclones." As all of these young men left to serve the Lord, their Mothers stayed in close contact, getting together every month to share their sons emails and experiences as each month passed. What a great love we have for these young men and their amazing families. This week we enjoyed our annual summer cookout, as they have all returned home from their missions around the world. 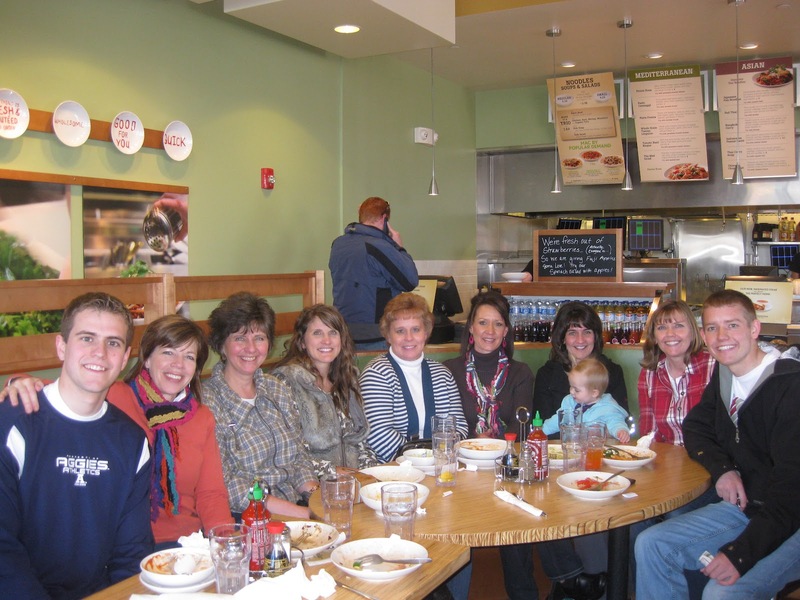 Britten absolutely beams with joy as he spends time with his many awesome friends and extended family. Elder Schenk's expected date to return home from his mission was aproximately June 28th. He would have reported to our Stake High Council probably on July 10th. We marveled at the realization that, that actually occured, the same day as if his accident hadn't happened. The spirit was so sweet and strong as 2 other wonderful Elders shared their experiences and testimonies. Britten also gave a wonderful report as Mom and Dad, his siblings and Grandparents listened. His spirit was sweet and pure as he told a couple of his experiences. He testified of the greatness of missionary work and how grateful he was that he could serve a mission. He loves his Heavenly Father and Savior Jesus Christ so much and he loves to testify of his love for them and of their love for him. He also told of one of his "friends" from Brazil that is now serving a mission. This is the same friend that sat at Britten's bedside day and night the first days after the accident til we could get there. He also talked about another "friend" from Brazil that is preparing to serve. Tears filled many eyes as the Stake President testified of the "Miracles that we have all witnessed"...."God is in charge." Come Run With A Champion! Hello all! It has been a while since I have had the opportunity to leave a post on this blog. I have some exciting news that I wanted to share with all of you! Countless people have offered and insisted that there must be something that they could do to help our family. A few weeks ago a group of amazing friends and family gathered together for this great cause. They came up with an awesome idea. 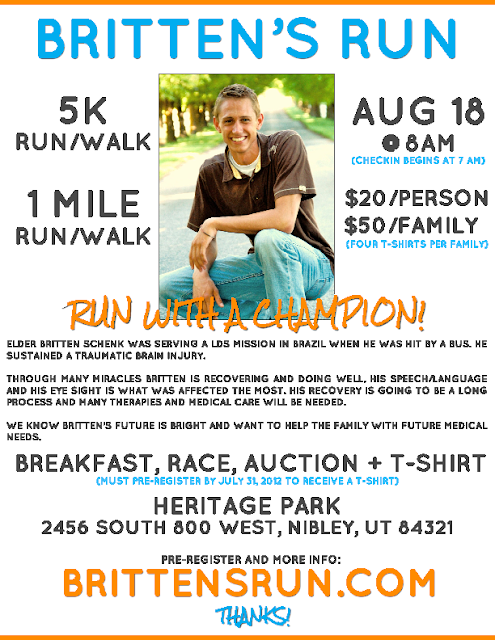 They are going to have a 5K or 1 Mile Run/Walk on August 18th called "Britten's Run"! This will give the family financial help for Britten's ongoing medical costs. It will also give people the opportunity to "help out". This will be a great venue for people to do this. This will also give many the opportunity to come and see/meet Britt. There have been so many that have wanted to come and visit Britt and have not either had the time or been able to connect with his schedule. He wears out easily and we know that this will be a perfect opportunity for him to see so many all in one place! The committee has done such a great job already in planning this event. It will truly be a great time, for the runners, strollers, walkers and observers. After the races we will be doing a breakfast. Upon hearing the menu, I decided that it could be my favorite part of the day :-) During the races and breakfast there will be a silent auction. Then, after breakfast, there will be a live auction. There have already been so many awesome and generous items donated! During all this there will be games and activities for children who would be bored with the "grown-up stuff". 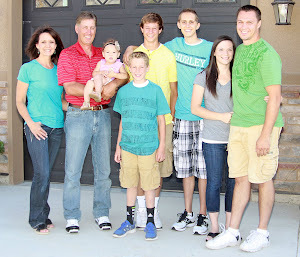 We have had many ask about finances and what the needs the family has. First and foremost we would like to thank The Church of Jesus Christ of Latter-Day Saints for the help recieved in Brazil and Britten's transport to the U.S.A. We feel very thankful for the blessings from above and feel great about Britt's progress so far. Britten has several therapy sessions each day and those will continue probably for the next year or so. We anticipate that he will also need some more sugeries and there will be future medical costs. We are still early in the preparations for this event and yet we have already had so much support from sponsors. I'd like to thank all of them at this time. 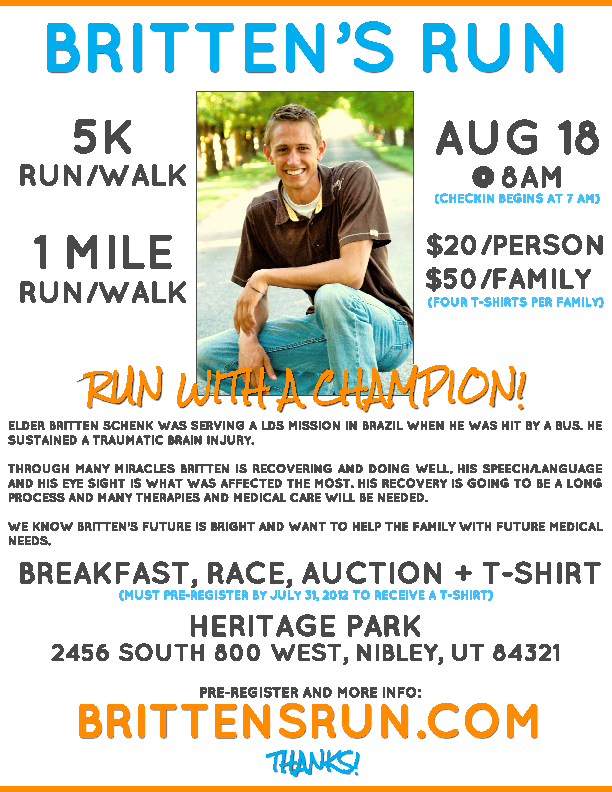 We know Britten's future is bright, so Come Run With A Champion! It has been a busy week! What am I thinking, all weeks are busy. The beginning of Britten's week was filled with appointments with Doctors, Specialists and Therapists. Britten is doing well. He has a long way to go, but, with a great attitude, support of wonderful friends and family, and faith in the Living God, he will succeed! Rarely have the Medical Professionals we have associated with, give any kind of time frame on or scope of Britten's recovery, and we understand that they cannot, there are just too many unknowns with Brain Injuries. Several have indicated that they expect it to take a couple years. With all the miracles that we have witnessed to this point, we know that we must continue to have faith and be patient, because as always has been, his recovery is in the Hands of the Lord. We have already been so tremendously blessed. The later part of the week was spent visiting family, being visited by mission "buddies" and watching a basketball tournament. As a family we have loved participating in and watching each other play sports. Britten loves most sports but as much as he loved swimming, he might prefer basketball. He loves watching and cheering for his younger brothers as they play. Even with his limited sight, he follows Canon with his eyes. He even sometimes sees the game better than the referees! haha. Britten is his brothers biggest fan! It was awesome that several of Britten's friends came to help cheer Canon on to victory as they won the "Big Mountain Jam" Tournament. We so appreciate the many mission "buddies", that have gone out of thier way to come and spend time with Britt. He has felt of thier love and it has been wonderful to see them reunite and talk about the mission. We are grateful to friends that have called and have come by to cheer up Britten's day. Another, talented, sweet friend came to sing and play her harp for our family and it certainly made our Sabbath Day complete! Britten has so many amazing friends. We love you all for your cheer, support, prayers and faith! As we read the testimony's being shared on the Blog, we are so appreciative to you, for sharing your strength with us. The day's are not easy and sometimes it is very easy to get discouraged and down. So thank you for your continued support because it gives us strength and encouragement to carry on.